There have been recent studies about the benefits of drinking green tea throughout the day. In fact, some researchers are now even extolling the benefits of drinking tea before bed. It doesn’t matter if you prefer to drink green tea hot or cold; you can enjoy it any time of the day – or night. Why is drinking green tea regularly so good for you? Researchers around the world have found that green tea has a number of benefits for nearly anyone of any age, but especially in adults. Healthy Bones and Teeth – In addition to being one of the most effective antioxidant herbs in the world, green tea has been found to benefit both bones and teeth. Scientists in China have found that green tea has the potential to treat and potentially prevent bone diseases such as osteoporosis and some forms of osteoarthritis.It does this by helping to balance and to nourish cells known as osteoblasts. Osteoblasts help build up and strengthen bone tissue while osteoclast cells cause degeneration or degradation in teeth and bones. Patients participating in the study that revealed this were exposed to epigallocatechin or ECG. This is a major component of green tea. What the scientists found is that ECG acted as a stimulant for their bone tissue and helped to promote bone growth by as much as 80%. Such increased levels of ECG was found to be a major factor in helping to prevent the loss of bone density and could keep those who drank green tea less likely to develop bone problems when consumed regularly.Also, the antioxidant catechin found in green tea can kill bacteria in the mouth that can lead to tooth decay, gum recession, tooth loss and other dental diseases. Scientists have also established a clear link between dental disease and increased incidences of heart disease. As with strengthening the bones, green tea can also support good dental health. Heart Benefits –According to the Centers for Disease Control (CDC), approximately 610,000 people in the United States die of the heart-related disease each year. Heart disease affects both men and women. 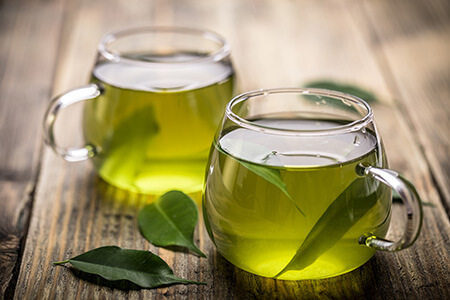 One of the ways to potentially lessen incidents of heart disease is by consuming the heart-healthy drink of green tea.Camelia Sinensis, or the herb that makes up all green tea, contains a number of chemical constituents within it that can help widen the blood vessels and arteries and improve their overall elasticity. Researchers learned that in as little as four minutes after consuming a cup of green tea, the blood vessels could be widened by as much as 4 percent, thus potentially preventing blood clots from forming within the arteries. Studies conducted at Harvard University suggested that green tea consumed over a prolonged period of time could potentially reduce the chance of developing heart disease by as much as 44 percent. 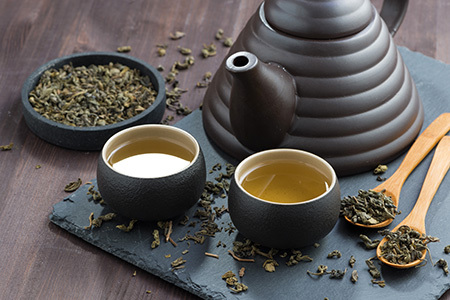 Building Up the Immune System – Since its discovery in China thousands of years ago, herbalists and healers have learned many ways that green tea can benefit the body. One way is by stimulating the body’s natural defense against illness through antioxidants. These can come in the form of flavonoids, catechins, and polyphenols which help the body to throw off potential viruses, colds, or other diseases by building up the body’s own immunity. This is particularly important for the elderly and those who are often exposed to illness. Some researchers have found that consuming a cup of green tea three times a day all year long is ideal. Potential Cancer Prevention – Researchers have also found that the antioxidant properties of green tea can potentially decrease some forms of cancer. These include breast, prostate, bone, colorectal, and other cancers within the body. Lessening the Onset of Diabetes – Recent studies have given results which may indicate that green tea can also help regulate glucose levels by reducing the speed at which blood sugar rises after eating. This can help reduce some forms of diabetes such as Type II. Green tea can help the body to regulate bodily blood sugar levels and reducing the chance of insulin sensitivity for those who experience insulin levels that are either too high or too low. Drinking Green Tea Before Bed – In spite of what you may have heard about not drinking anything with caffeine in it before calling it a night, there can be some real benefits to enjoying a cup of green tea before bedtime. Of course, there are some people who do have medical conditions who just cannot tolerate any caffeine at all. 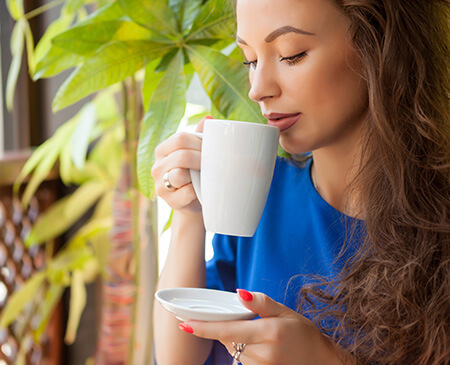 Thankfully, such conditions are usually rare.Believe it or not, the levels of caffeine found in green tea can actually help some people in achieving a more relaxed state. Warm drinks can help make you feel sleepy; however, one of the chemical constituents in green tea is the amino acid L-theanine. On its own, L-theanine found in green tea can actually help you to relax and achieve restful sleep.In fact, recent studies have shown that research subjects who drank green tea regularly before bedtime found themselves to be more alert and demonstrated greater cognitive function during the day. At the International Conference on Alzheimer’s and Parkinson’s disease in 2015, the Lundbeck Foundation presented a paper which indicated that drinking green tea 1 – 6 times per week markedly reduced mental decline. Those participating in the study who consumed green tea scored higher on thinking and memory tests than those who didn’t consume green tea. Other Benefits – The presence of epigallocatechin-3-gallate or EGCG in green tea also helps to further reduce free radicals in the body and can help detoxify your liver, all while you are sleeping. While almost everyone is aware of how green tea can be a great help to reduce cravings during the day and can in give a boost when you’re trying to lose weight, it can also do the same while you’re sleeping, too! Consuming a cup of green tea just before going to bed has also been shown to aid in digestion and can reduce nighttime cravings in the wee hours of the night. Also, for those who have nighttime bouts with acid reflux, green tea can also help reduce the incidents of reflux and its severity. As you can see, there are plenty of benefits to drinking green tea every day. Is it any wonder that other than water, green tea has become the most popular drink in the world? Haley, James. The Green Tea Handbook: a Natural Wonder for Weight Loss, Cancer, Heart, Bone, Oral Health, and Your Immune System – Benefits, Extracts, Recipes & More”, 2013, Kindle Edition, Amazon Digital Services. Zak, Victoria. “20,000 Secrets of Tea”, 1999, Random House, New York, N.Y.